Introducing Waitlist for WeTravel Trips! How many of your clients might be interested in a sold out trip, but are too lazy to write you an email? WeTravel’s new waitlist function helps you to capture all these potential clients. With just a few clicks directly in your booking window, clients add themselves to your waitlist. We will help you to collect contact information from interested customers and invite them to the trip if a spot opens up! The waitlist function will automatically appear in the checkout process once the trip has been sold out. This makes it easy to collect contact information from all of the potential leads interested in the trip and contact them when a spot opens up or use the information gathered to market other upcoming trips. – Johannes Koeppel, Co-Founder & CEO WeTravel. The waitlist is easy to set up in your trip builder and will be automatically live as soon as your trip has sold out. Once it’s set up you can leave it to WeTravel to do the rest of the work. Find out more about how to set up a waitlist through our Help Center. 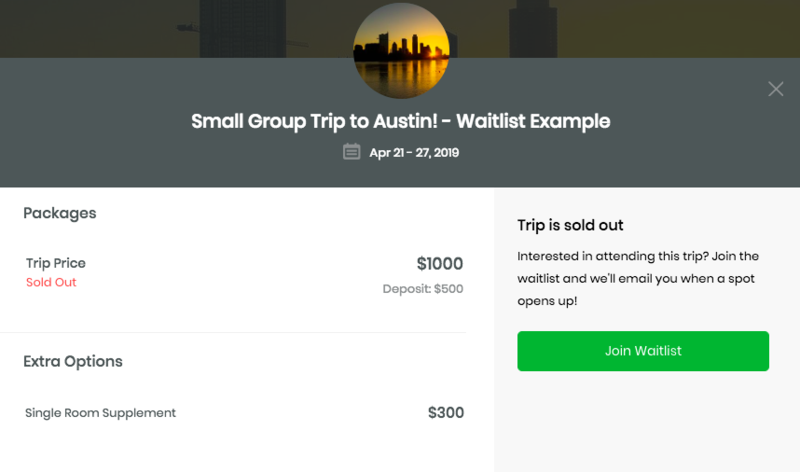 Having access to a waitlist will benefit both trip organizers and participants, and we’re so excited for our current and new operators to take advantage of this!